My main tower is a 50-foot freestanding aluminum tower from Universal Towers (Model 15-50). Mounted just above the bearing is a 3 element Steppir with the 40/30-meter option. Mounted just above the Steppir is a M2 2M12 mounted horizontally for 2-Meter SSB. At the top of the mast is a comet GP-9 dual band omni. Tower number two is a 35-foot Roan 25 tower with a house bracket. 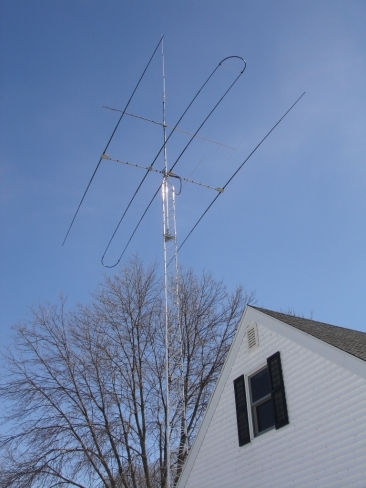 The long horizontal antenna is a Spi-Ro LS-80K 80-Meter rotatable dipole. 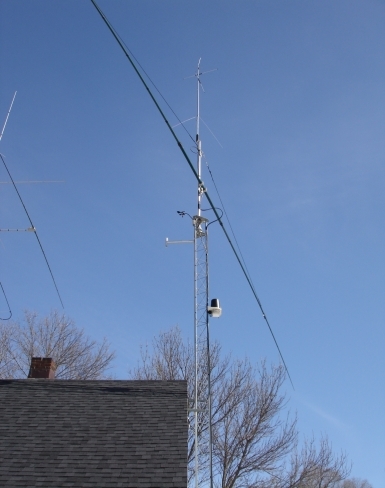 Mounted at the top of the mast is a Cushcraft MA5VA HF vertical.